Mercury is difficult to observe from Earth, being so close to the Sun and therefore constantly in its glare. At best, it rises 2¼ hours before the Sun and sets 2¼ hours after it, so always appears just above the horizon, bathed in the light of dawn or dusk. Even the Hubble Space Telescope cannot be trained on a point so near the Sun, which explains why little was known about Mercury prior to the first space mission, and why it remains the least explored planet in our solar system after Pluto. In 1974 and 1975, the US probe Mariner 10 made 3 flybys of Mercury and at one point was just 327 kilometres away. It took numerous measurements of its temperature and magnetic field, as well as some 4,000 close-up shots with an accuracy of 1 to 2 kilometres. These photographs cover nearly half the planet’s surface, including much of the side normally hidden from us. 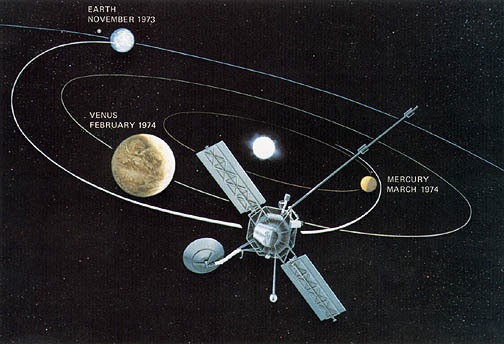 Among other things, Mariner 10 revealed the existence of a magnetic field, providing support for the theory that Mercury possesses a large metallic core. 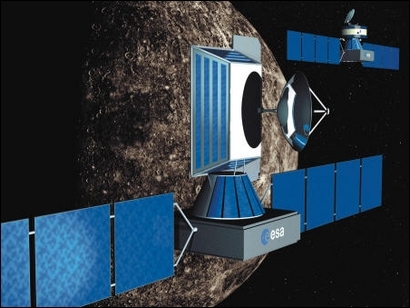 While there have been no more missions to date, ESA is currently gearing up for BepiColombo in 2011-2012. The BepiColombo mission aims to study Mercury’s structure and history, in order to glean valuable information on how Earth and the other planets of our inner solar system were formed. In addition, NASA plans to send its Messenger probe towards Mercury from 2004. ...at aphelion (its greatest distance from the Sun), Mercury's strongly elliptical orbit would give you the illusion of the Sun suddenly shooting backwards in the sky.